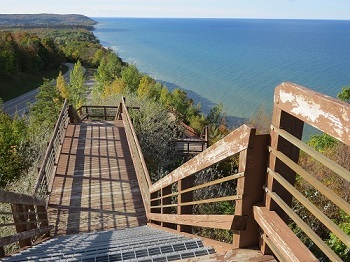 Just outside of Arcadia and right on M-22, Inspiration Point is a special place of interest, being the highest point on the shore of West Michigan. Also known as Arcadia Overlook, Inspiration Point in Benzie County offers a beautiful view of Lake Michigan and the surrounding topography. The township of Arcadia is at nearly zero elevation, so as you are making the steep drive along M-22 up to Inspiration Point, which is at an elevation of 800', the height seems even more monumental. Even before the official overlook was built, locals used to climb the dune for the tallest view around. Now, with viewing decks and 210 stairs, people can easily obtain this breathtaking view. Climbing all the way to the top, an 80 foot vertical ascend from the bottom deck, you feel on top of the world looking over the lake and the whole county. A telescope is available to make your view more clear and catch a glimpse of any passing ships and sailboats. After making the climb onto the top deck, you may notice a worn path over the fence on the north side. If you are feeling adventurous, hop the fence and follow the short path through the trees. Be careful where you step – it follows the cliff! There are good trees to step up a hammock. Experience Inspiration Point like a real local with this “secret” path. 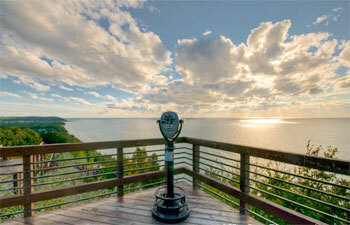 Every hour of everyday offers a slightly different view of Lake Michigan on this overlook. On a windy day, admire the whitecaps of the mighty Lake Michigan. On another day, especially in the quietness of the morning, the lake can be as calm as a pond. Of course, it is the glorious display of color with the setting sun that draws a crowd every single night. Check out TripAdvisor for traveler's photos and reviews about Arcadia Overlook / Inspiration Point.